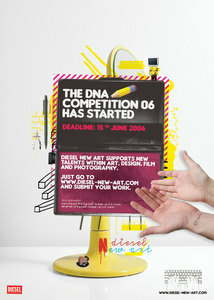 Diesel is sponsoring another brilliant design competition - the DNA Competition. You can submit to the Denmark, Sweden, Norway, or Austria panel of judges, and the categories are Action, Digital, Draw, and Photo. It’s unique in that you can show the progression of your works development through uploads until the deadline… fun layout of the site too.